Tour 1983 debutants; Robert Millar(left) & 'Patro' Jimenez(Colombian National Amateur Team) on stage 10. The two mountain goats are alone and riding tempo to Luchon. 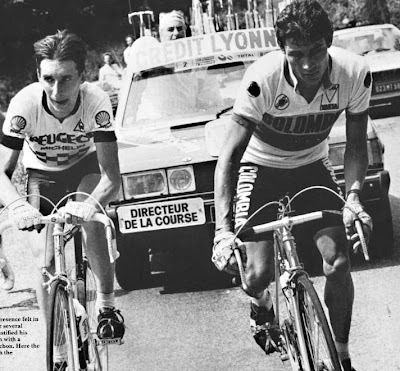 Second place in the prestigious 1983 Dauphiné Libéré assured Peugeot's climber Robert Millar for his debut at the Tour de France. Pascal Simon & Phil Anderson started that Tour as co-leaders for Peugeot with support from Millar and Stephen Roche. Disaster struck early in the form of bad luck during stage 3 over the cobbles of Roubaix. Millar fell 3 times over the pavé losing a whopping 16 minutes over winner, Rudy Matthijs. Least to say, Millar was looking forward to the 2nd week where the mountains awaits. Stage 10(201 kms) would be his salvation, perhaps the hardest mountain stage into the Pyrenees from Pau to Luchon. And to be feared, grimacing with 4 major climbs: the Col de l'Aubisque, Col du Tourmalet, Col d'Aspin and the Col de Peyrosourde. 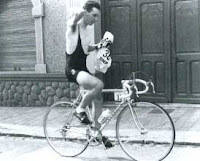 Belgian ace grimpeur, Lucien Van Impe(at the remarkable age of 37) was the first over the top of the l'Aubisque snatching important points towards the KOM competition. On the climb up the Tourmalet the magnificient Columbian climber, Patrocinio Jimenez accelerated with only Millar capable of following. As Millar neared the summit he would be the first British rider to win the Souvenir Henri Desgrange Trophy, a memorial to the founder of the Tour. Jimenez was first over the summit of the Tourmalet, a 2,113 meter monster - the highest point of the Tour. The Columbian, another Tour debutant, would do it again leading Millar first over the Col d'Aspin thus gaining maximum climbing points. Up the final killer of a climb, the Peyrosourde, Jimenez appeared to be laboring when a fresh Millar made his move. He bolted passed the exhausted rider finally getting rid of Jimenez on the descent into Luchon. Pedro Delgado, another Tour debutant, was a dangerous chaser overtaking the Columbian within eyesite of the Scot. Robert Millar rode alone into Luchon and finished 6 seconds clear of the quickly gaining Delgado. For Jimenez, not known to be a good descender, placed fourth behind faster descender Pascal Simon. Robert Millar(at 24 years old) became the first Scottish rider in Tour history to win a major mountain stage. "I knew when I got up in the morning I was going to win that day. I just felt it. I just felt that nobody was going to beat me that day. I was confident all day," Millar said afterwards. An impressive victory after more than 6 hours over difficult mountainous terrain. What a debut for the young Scottish climber! (Inset photo): No privacy here. Millar freshens up during his debut Tour de France, 1983.